I was heartily welcomed and had very productive meetings in Washington DC with the US National Park Service, the Aldo Leopold Wilderness Research Institute and the Carhart Center. I attended two interesting presentations, one by Susan Fox of the Aldo Leopold Wilderness Research Institute about the institutes current research projects, and one by Andrea Gehrke of the Carhart Training Center. I will meet both Susan Fox and Andrea Gehrke again when I am in Missoula. Furthermore, a meeting with Sarah Gulick and Chuck Dunkerly of the Harpers Ferry Institute by the National Park Service gave insights in short film opportunities about wilderness and their awareness and support raising effect on the public. We also planned a second meeting at the Harpers Ferry Center for the beginning of April. Today’s meeting with Jonathan Putnam, Office of International Affairs, Roger Semler, Chief of the Wilderness Stewardship Division, and John Dennis, all three from the National Park Service, was a success as well. We exchanged knowledge and interest on each others work and future co-operations, in particular through an international Wilderness Fellow Program and Wilderness Workshops. 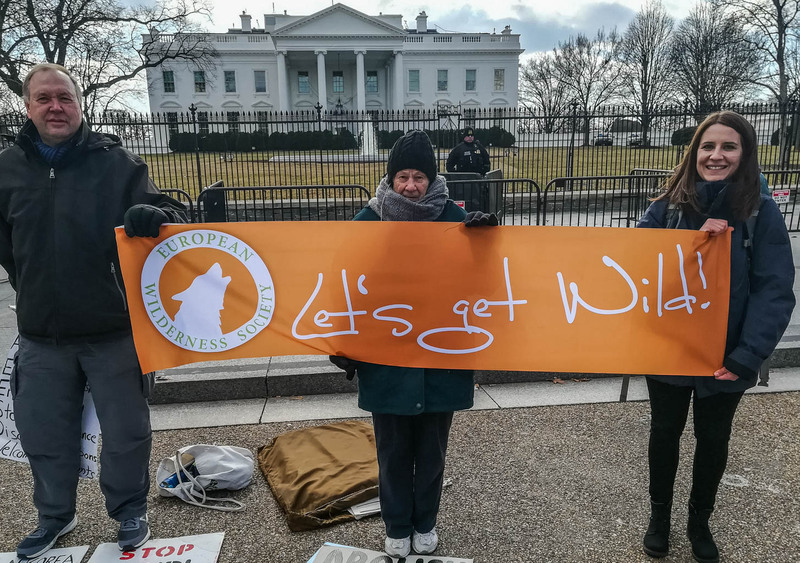 As a reminder to protect Wilderness not only internationally but also in the USA, I could not help myself to take a photo with our “Lets get Wild” Banner in front of the White House. Mr Trump: Save the Wilderness! Next week I will meet with Peter Keller, Program Adviser International Technical Assistance Program. After that I will travel on to Boulder for meetings with John Hausdoerffer of the University of Western Colorado as well as with the WILD Foundation, the Leave no Trace Center for Outdoor Ethics and Erin Drake, Wilderness Communications and Outreach Specialist of the National Park Service.